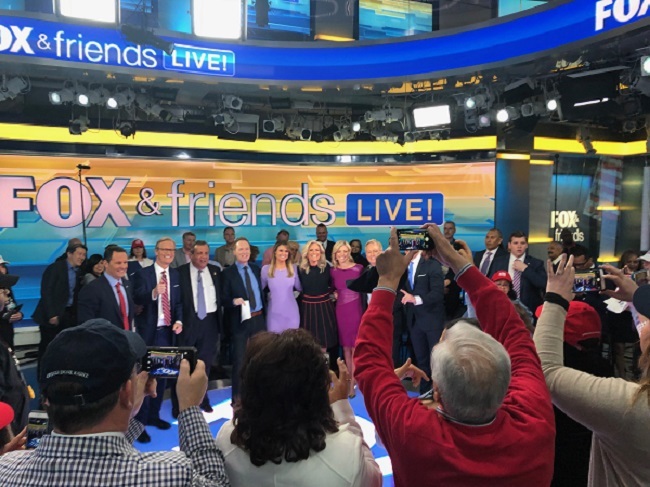 Fox & Friends will have even more friends than usual once a month. 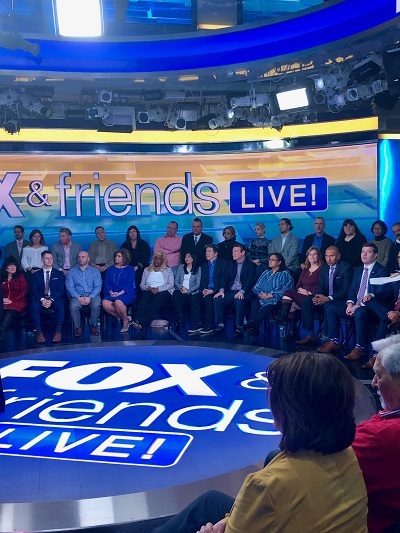 The show will include a live studio audience on a monthly basis, starting with this morning’s broadcast, which TVNewser attended. There were roughly 50 people seated in the audience for the entire three hours, beginning at 6 a.m. Audience members were selected by submitting a form online; the show looks for people “who are passionate about politics” and picked the audience randomly. 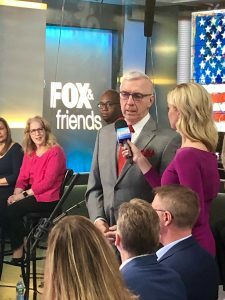 The audience was pretty enthusiastic throughout the morning, thrilled to see their TV news heroes–Ainsley Earhardt, Steve Doocy and Brian Kilmeade–up and close and personal on the “curvy couch,” and took plenty of selfies with them during commercial breaks. 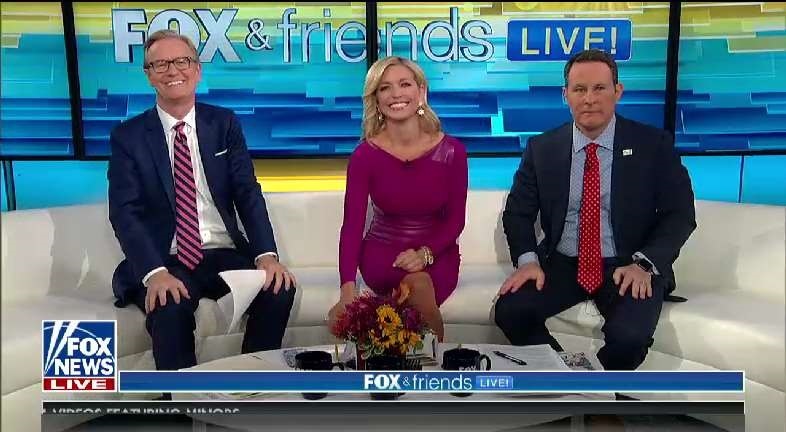 The Fox and Friends team has apparently been mulling this idea around for a while, and said it was a collaborative decision by producers. We asked the hosts what the live dynamic adds to the show. 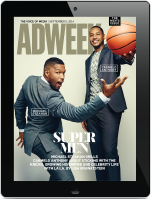 The audience reacted audibly at various points throughout the broadcast. They applauded when someone said something they liked. For instance, when Chris Christie, who came on the show at 8 a.m., remarked, “The Democrats will not win on Socialism, and the American people like what President Trump has done for the country,” the audience broke out in applause. They booed or groaned when they heard things they didn’t like, including comments pertaining to Democratic Party policy (i.e. the Green New Deal) or a clip from Wednesday’s Michael Cohen testimony. What didn’t necessarily work quite as well was asking policy-related questions of individual audience members. This is something Doocy hinted at, and we noticed it too. At one point, Earhardt asked a couple of folks about climate change. She brought up the Green New Deal, which is the Democrats’ proposal of stimulus programs meant to address climate change and economic inequality. The audience booed when they heard that phrase, which influenced Earhardt to ask someone why they didn’t like it. One person said he didn’t know enough about it to respond. 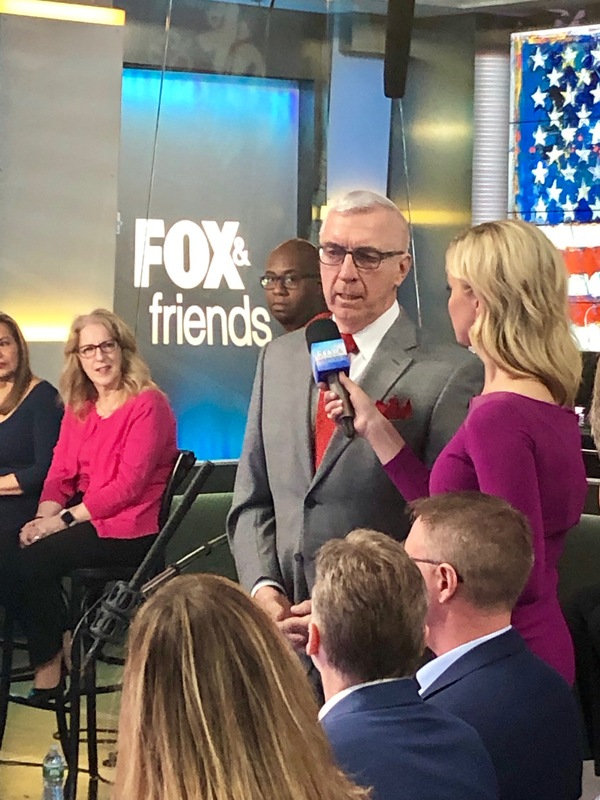 Now, granted, this is live TV, and the folks in the audience aren’t professional newscasters, politicians or pundits, but perhaps the program should stick to having their audience be the ones asking the questions, as opposed to answering them. Having audience members ask questions of talent was a slightly smoother process. During commercial breaks, a producer would go around, and tee up various members of the audience to ask questions. For instance, one man asked Christie about the Mueller investigation. Another asked: “Are we ever going to investigate Hillary Clinton?” to which Christie responded, “We may have missed our window,” which elicited groans from the audience. 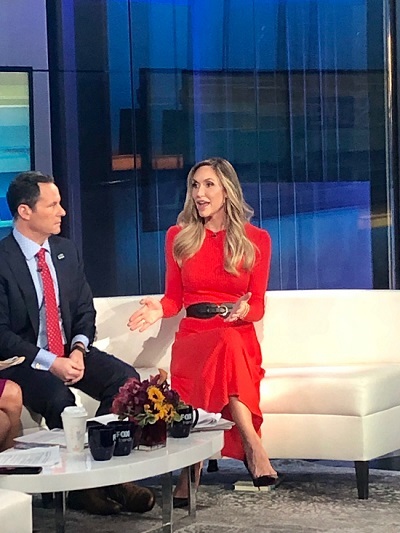 Lara Trump made a pitstop on the curvy courch from 8:20-8:30 a.m. She was treated like a celebrity by the audience, and happily posed for selfies before and after her appearance. Jesse Watters stopped by towards the end of the show. In addition to taking a few shots at Democrats, Watters promoted this coming Saturday’s episode of Watters World, remarking that he’ll have a Trump and chairman Kim impersonator on the show. Janice Dean and Tom Shillue came by towards the end of the show as well, to play “Famous Kims,” a trivia game about people and objects the share that first name.